Posted on Thursday, November 10th, 2011 at 7:30 am by Pieter van der Westhuizen. In the previous part we looked at using Extended MAPI to handle new mails in Outlook and despite the fact that is does a pretty decent job of it, it still has some serious limitations. In this, the fourth and final part of the series, we will write our own solution to the problem. Before we start I want to give a HUGE thank you to Renat, this post would not have been possible without his assistance and advice. The add-in we’re about to write will solve the NewMail challenge in a few ways. First, we’ll write logic that will scan all mail folders and check for any new e-mails. This logic will be fired on Outlook start up using the AddinStartupComplete event and after the Outlook synchronization finishes, the SyncEnd event will be used for this. The NewMailEx event will also be making an appearance and despite its limitations it can still be useful to catch some incoming e-mails. We will save a last received date and time to know which e-mails are new. It is important to save the last received date for each profile because the user can receive an e-mail at different times for different profiles. We will also keep a list of e-mails that was already received, using this list we can check any new e-mail and whether we already processed them. If the new e-mail is not already in our list we will save it, and as soon as we’ve processed it, it can be removed from the list. Right, enough talking, let’s get down to business. 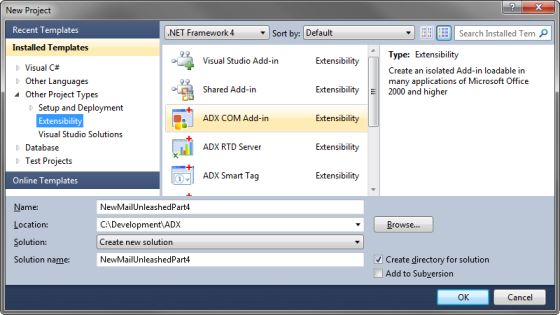 Same drill as always, start by creating a new ADX COM Add-in in Visual Studio. 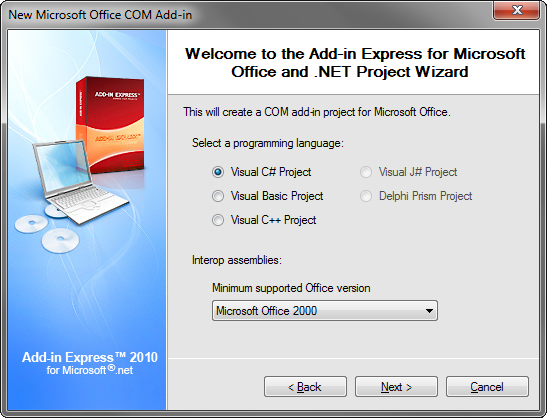 This solution will work in all version of Microsoft Outlook so select Microsoft Office 2000 as the minimum supported Office version. 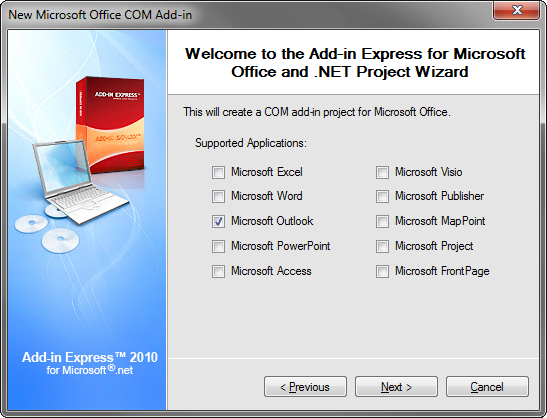 On the next screen, only choose Microsoft Outlook in the list of supported applications. We need to store the information about the e-mails and times somewhere, for this we will create a local xml file. In order to make it easier to work with this file, let’s create a class called SyncItems. This class will have a list of SyncTime items, one entry for each account in Outlook as well as a list of SyncItem items containing entries for each new email. The class has a number of methods. The most important is the Load method, which will check whether the xml file exist and will also create a file if it does not exist. If the file exists it will load the data in the file into the class’ Items and SyncTimes lists. Opposite to the Load method is the Save method, which in turn will save the data in the Items and SyncItems lists to the xml file. One last method in this class is InitializeSyncTimesAccounts; it sets the last received dates for each profile in Outlook. The class also has an event which will be raised as soon as a new e-mail is added to the Items collection. With the required classes in place, switch to the AddinModule’s designer and drag a new Timer component called mailCheckTimer onto the designer surface. Set its Enabled property to True and its Interval property to 1000. Next, select the AddinModule designer and double-click in the AddinStartupComplete event to generate a new event handler. We will assume that if the xml file does not exist, that this is the first time the add-in is run and set the last received date to the current system date. If the file does exist, we load it and lastly we start the timer. This will process any e-mails received in the NewMailEx event, check if it is already in the xml list of e-mails and add it if it is not. Phew, that took some doing and as you can see there are various scenarios you would need to take into consideration in order to effectively handle new e-mails in Outlook. The big benefit of this approach is it will work in all versions of Outlook and is certainly likely to work in any future versions of Microsoft Outlook. Thank you very much for reading! And again a big thank you to Renat and Dmitry for their help and advice during this series. Until next time. Keep coding! What happens with the performance? it seems that the folders are scanned in the same thread, i assume Outlook will not respond during the scanning..
Scanning should be done on the main thread to avoid Outlook crashing. We haven’t seen any perfomance knocks during our tests.If you have *a lot* of folders I guess you might have some perfomance issues. However, you can then always write logic to only scan certain folders. Do you think it’s possible to do this job (scanning folders) in the background using extended MAPI ? I already do some background processing on folder using Redemption and after some tweaking (check that MAPI is initialized once per thread, re-use the same thread to avoid a bug after several hundred of MAPI initialization, etc.) it seems to works fine. Thank you for this last part, it helps a lot. Btw, I found Microsoft very bad on this point, as I don’t understand how there is no simple way to get this “NewMail” event correctly. I guess if you have a lot of folders it could cause some performance problems. In this case I would write some logic to specify which folders to scan. Thanks very much for this. I have implemented it and it seems OK but the SyncEnd event is never firing. I have adapted it for vb but it has the correct Handles statement. My dev machine runs Outlook 2013 with an Office 365 account. Would this effect the sync event? I cannot find any ADX documentation on this event. Due to an issue that was reported at : https://social.msdn.microsoft.com/Forums/office/en-US/7a20664c-7650-4d61-9d5f-13f1d929a8cd/outlook-2013-automatic-sendreceive-doesnt-work-with-the-sample-addin-below?forum=outlookdev. The SyncStart, SyncProgress, SyncEnd, and SyncError events don’t occur because they are disconnected in Add-in Express. However in the latest build(v7.7.4087) there is a way to handle these events by setting the SyncObjects property to true. This property is located under the HandleEvents property. I have the latest Add-In Express, and it seems that the SyncStart, SyncProgress, SyncEnd, and SyncError events are still not firing. 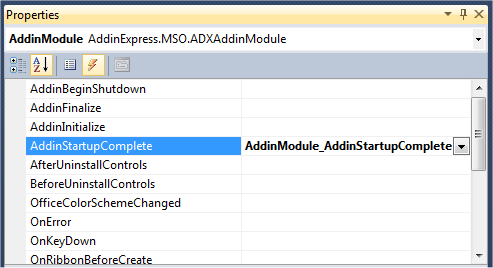 You need to add the ADXOutlookAppEvents component to your add-in module designer and change the HandleEvents property.